The man with the gun pushed me down onto the carpet. I tried to cower to make my body curl smaller, instinctively covering my head. ‘Oh God, please don’t kill me.’ My words clung to my teeth and now my whole body was so cold. All I had left were these words. I wanted to live and I knew it with absolute certainty. I don’t want to die. Emma Slade was a high-flying debt analyst for a large investment bank, when she was taken hostage in a hotel room on a business trip to Jakarta. She thought she was lucky to come out of it unscathed, but over the ensuing weeks and months, as the financial markets crashed, Emma became her own distressed asset as the trauma following the event took hold. Realising her view on life had profoundly changed she embarked upon a journey, discovering the healing power of yoga and, in Bhutan, opening her eyes to a kinder, more peaceful way of living. 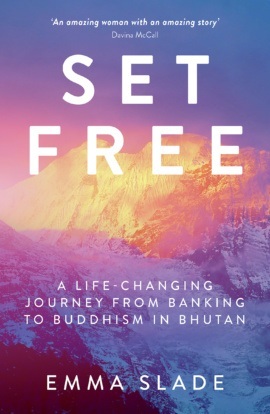 From fast-paced City life to the stillness of Bhutan’s Himalayan mountains, Set Free is the inspiring true story of Emma’s astonishing life lived to extremes and all that that entails: work, travel, spirituality, Buddhism, relationships, and the underlying question of what makes a meaningful life. Emma Slade is an ordained Buddhist nun, yoga and meditation teacher, and author. She is based in Whitstable, Kent, but spends several months per year in Bhutan where she set up and runs a charity called Opening Your Heart to Bhutan, which manages projects to help rural children.